The APhA Board of Trustees is responsible for broad direction setting of the Association including APhA's Vision, Mission, and Value Statements and APhA's Strategic Plan. Practitioners in community, hospital, and more specialized areas belong to the Academy of Pharmacy Practice & Management (APhA-APPM). Scientists practicing in pharmaceutical, clinical, economic, and other areas of research belong to the APhA Academy of Pharmaceutical Research and Science (APhA–APRS). Students who are enrolled in a program at an accredited school of pharmacy belong to the Academy of Student Pharmacists (APhA-ASP). 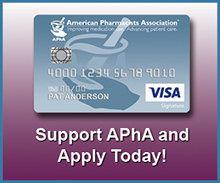 APhA is seeking candidates for the 2018 APhA Election.